Are you a real estate professional? Do you need to renew your real estate license? If that is the case, 4ICE.com could be of your interest. On this site you will be informed about approved courses you can take to get course-credits to renew your license. This organization offers real estate approved courses in different states, ranging from Arizona to California. In case you need to get education credits to renew your real estate license, the Institute for Counting Education might be an interesting option for you to consider. This counting institute offers distance learning courses for real estate professionals who need continuing education credits to renew their licenses. 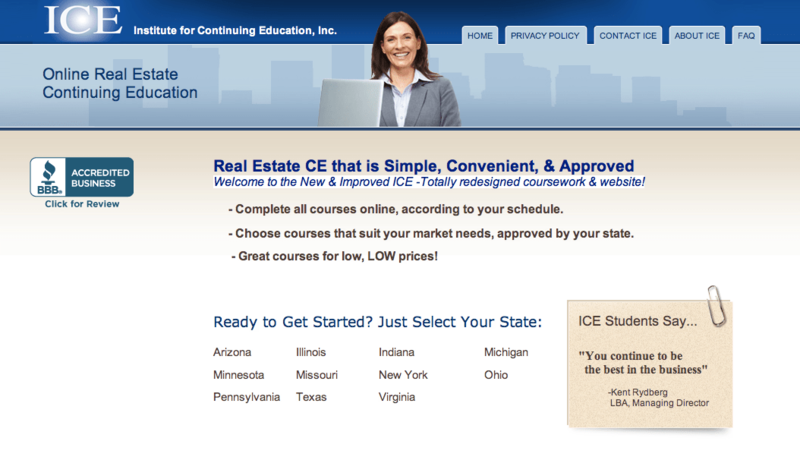 Feel free to stop by 4ICE.com to learn more about these courses. Do you work in the real estate business? Would you like to renew your license? Then, 4ICE.com might be worth a try. This education institute offers distance learning courses for real estate professionals.